What is the Stratified Systems Theory (SST)? Elliott Jaques proposed the Stratified Systems Theory (SST) based on his experience in organisational design since the 1950s. The SST identifies seven strata of work based on decision-making complexity measured in terms of the time span of the work involved. Focused on fair and equitable remuneration, Jaques discovered that people naturally agreed with pay based on the time-span of discretion which he also refers to as the by-when (or how long the employee’s longest task takes) and used this to measure the complexity of the work. The associated Requisite Organisation (RO) approach, a triple bottom line business management methodology, was conceptualised based on SST research of work complexity and human capability. RO can be described as a set of guidelines or rules combined with a structure (SST) that aims to improve organisational effectiveness. According to SST advocates, RO was introduced as one of the first measurable, systematic and scientific approaches to management. It revolves around the time-span of discretion as an objective measure of job complexity. RO also classifies people in terms of their natural capability to effectively deal with tasks of a certain level of complexity or time-span. Jaques’ work has been interpreted, adapted and reformulated often and the development of the theory continues. Some of the associated models include an eighth level and some have reduced the number of levels. The roles and complexity terms are also linked differently to the levels by certain theorists. Alternative contributions in this field include Stafford Beer’s Viable Systems Model (VSM), Checkland’s Human Activity Systems (HAS), Hoebeke’s Domains of Work and Prinsloo’s Information Processing Model (IPM). These various approaches cause some discrepancies in articles and research. Jaques (1990) considered the levels to be qualitatively discrete at specific time-span increments. Moving from one level to the next means that the type of work and the scope of responsibility is qualitatively and fundamentally different. Differing time-spans on the same level are quantitatively different, but not qualitatively different. The strata apply globally and to all organisations regardless of their industry or size (with some of the notable exceptions of partnerships, churches, universities and hospitals). The time-span of the longest tasks and how they are split in the strata are naturally occurring and Jaques identified them through research (by checking the felt weight of responsibility, felt fair pay and whether managers were “too close” to their subordinates). Jaques (1990) referred to the consistency of these boundaries as reflecting “some universal truth about human nature”. People can potentially manage a specific level or work naturally. Potential capability refers to the work that the person can do but may not be currently be doing. While a person may be able to manage more complexity later in life – the development pathway is specific and not in the person’s control and will follow a specific route or “mode on the time horizon progression array” (Jaques, 1996). The maturation of individuals along the pathways occurs regardless of race, ethnicity, cultural background, education, occupation or socioeconomic opportunities. People are also generally aware of these differences and can sense if someone can cope with the same or different amount of complexity than themselves (Jaques, 1996). 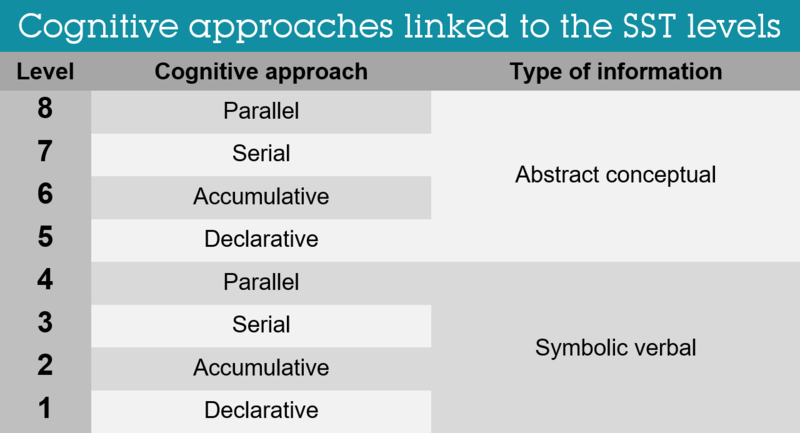 These four methods or types of mental processing are applied to different orders of information, namely symbolic verbal and abstract conceptual information. In the case of symbolic verbal information, thoughts are used as symbols whereas in abstract conceptual information, thoughts refer to thoughts. The four cognitive approaches specified, and the structure of the information capitalised on, are linearly linked to the levels of work as specified by the SST. The first four levels of the SST are linked to the first four processing approaches using symbolic-verbal information, and the SST levels five to eight (as the SST model does go up to eight instead of seven in some formulations), involve the application of the same four processing approaches using abstract conceptual information. Jaques and Cason’s research has shown that the category of complexity of mental processing is a valid method of measuring an individual’s potential to deal with various levels of work complexity. Jaques (1996) makes specific statements to define what decision-making is in RO theory. He points out that decision-making involves uncertainty. If all the reasons for a certain decision can be stated, he regards it as a calculation. Decision-making thus involves never being sure that you are right. This also means that it involves information that you cannot be sure about because the information is vague, incomplete, irrelevant or excessive in quantity. In the 1950s, Jaques consulted for Glacier Metal Company and this resulted in a body of work called the Glacier Project Papers by Jaques and Brown (1965). His work during this time resulted in many of the insights he formalised later into the SST and RO approach. Understanding management: managers need to be accountable for the work of their subordinates and have just enough authority to control their subordinates’ output. Understanding the level of responsibility: the weight of responsibility felt in any role is directly related to the duration of the longest task (the responsibility time-span). Understanding the strata: realising that there are discrete boundaries based on the time-span of the longest task. Real managerial boundaries occurred (from over 100 of Jaques’ studies) at time-spans of 3 months, 1 year, 2 years, 5 years, 10 years and 20 years. This applies globally and regardless of the type of corporation involved. Elliot Jaques and Kathryn Cason co-founded the Requisite Organization International Institute which continues to research RO principles. It improves employee morale and makes people feel valued for their contributions. It improves employee productivity and makes them feel empowered to complete their tasks. People judge the remuneration earned by different people as fair. It results in an effective, natural hierarchy where bosses are invested in their subordinate’s work (as they are solely responsible for the employee’s output). It reduces stress and frustration as people working above their capability are not unduly pressured and people working below their capability are not frustrated that they cannot contribute more effectively. The theory has also been adapted and developed to suit a variety of companies’ and consultants’ needs. A variety of SST assessment techniques for both individuals and roles have been developed. In Requisite Organization (1996), Jaques objectified the process of evaluating the complexity of discrete tasks by means of the following steps. Firstly, it requires the specification of the intended output, using task-target-completion time (by-when). This is followed by an analysis of the work that will be required to achieve the required output. To achieve this, he specified the criteria by which the work can be categorised in terms of its level of complexity. For example, Stratum 1 work is characterised by following a specific plan to achieve an identified goal; Stratum 2 requires the accumulation of data and a diagnostic judgement, etc. Finally, the level of the project is allocated to reflect the most complex criterion which applies. Alternative SST job evaluation systems aimed at analysing the complexity of work, such as the Contextualised Competency Mapping (CCM) of Cognadev, are also available. In terms of people assessment some approaches are insightful and offer value, whereas others merely measure intelligence quotient (IQ) or ability test constructs and then link the output to SST levels as an afterthought. Jaques (1996), however, rejects the application of IQ test ratings in identifying the most suitable level of work complexity for a person. Only assessment methodologies that measure Jaques’ constructs (or approximations of them) will be discussed. One of the most commonly applied assessment techniques in this regard is Gillian Stamp’s (1984 in Lewis, 1993) Career Path Appreciation (CPA). The CPA is a structured interview technique, aimed at evaluating the level of complexity a person is comfortable working at. According to Stamp, both work and the human capacity to master that work are hierarchically stratified, where higher levels entail greater levels of complexity. Stamp’s structured CPA interview technique consists of three sections: phrases, symbols and work history. The interviewee selects from nine sets of six phrase cards those that best describe their approach to work and then elaborate on that. A card sorting task using geometric symbols requires of the test candidate to discover a sorting rule. This card sorting task informs the stylistic preference of the candidate. In the work history part of the interview the candidate provides a chronological description of past work assignments; their experience of the associated levels of challenge involved and the time span of these tasks. The CPA yields an indication of a person’s work progress – both their current as well as their future work capacity, the latter which is referred to as “mode” by Jaques (1989). The mode is determined according to empirically derived age-related progression curves which are graphically represented. In terms of the validity of the CPA assessment process, it seems that the CPA result is affected by interrater reliability (the subjectivity of the interviewer); the verbal skill of the interviewee; and the degree of rapport between the parties. Another factor that may skew the results is that candidates may, in hindsight, justify or exaggerate their past career-related achievements. These factors may significantly affect the validity of the CPA and other interview-based assessment results. Regardless of any criticism, the SST model as well as the CPA and similar SST-based interview techniques are widely used for job- and organisational structuring purposes as well as people-job matching, succession and remuneration initiatives. This blog is part of a series on models of work complexity, which includes “What is the Information Processing Model (IPM)?”, “What is the Viable Systems Model (VSM)?” and “Models of Work Complexity: a comparison of the IPM, SST and VSM”. Elliot Jaques and Kathryn Cason co-founded the Requisite Organization International Institute which continues to research RO principles. The institute also offers support and advice for companies wanting to implement RO principles. “In Praise of Hierarchy” is an article (1990) that Elliott Jaques wrote for Harvard Business Review (HBR), which focuses on briefly explaining RO and how it was developed. Jaques’ step-by-step explanations make his reasoning easy to follow. Jaques also wrote “Taking Time Seriously in Evaluating Jobs” for HBR in 1979. For assessment methodologies, you can read more on Cognadev’s information processing approach to measuring the cognitive complexity preferences and capabilities of people. The specific assessments for individuals are the Cognitive Process Profile (CPP) and Learning Orientation Index (LOI). The Contextualised Competency Mapping (CCM) tool is used to assess the level of complexity of a role or position (amongst other things). Bioss applies Stamp’s structured interview, the Career Path Appreciation (CPA) and the Modified Career Path Appreciation (MCPA) questionnaire to assess the cognitive and personality characteristics associated with career progress. Jaques, E. (1998). Requisite organizations: a total system for effective managerial organization and managerial leadership for the 21st century (Rev. 2nd ed.). Arlington, VA: Cason Hall. pp. 2, 33–42. ISBN 978-1886436039. OCLC 36162684. Jaques, E., & Cason, K. (1994). Human Capability: A Study of Individual Potential and Its Application. Arlington, VA: Cason Hall. Lewis, P. (1993). Career Path Appreciation (CPA). Data Reduction and Analysis. Technical Report 983, Auburn University, August 1993. McMorland, J. (2005). Are you big enough for your job? Is your job big enough for you? Exploring levels of work in organisations. Business Review, 7 (2). University of Auckland Business School. Prinsloo, S. M. (1992). A theoretical model and empirical technique for the study of problem solving processes. PhD, RAU, Johannesburg. Prinsloo, S. M., & Barrett, P. 2013). Cognition: theory, measurement, implications. Integral Leadership Review. Prinsloo, S. M., (2018). The CCM e-learning course. Cognadev. Johannesburg. Prinsloo, S. M., (2018). The CPP e-learning course. Cognadev. Johannesburg. Rasky, S. F., (1985). Corporate Psychologist: Elliott Jaques; his ideas on work take hold. The Times.